The brand-new Salesforce Transit Center in San Francisco that opened about a month ago took more than 20 years to plan. It also took more than a decade to build. And there were times when it didn’t look like it was going to end up being constructed. But after seeing the finished product, most people in San Francisco are saying the $2.26 billion creation that spans over five city blocks was well worth the wait. Part of the reason people have already fallen in love with the Salesforce Transit Center, which is being called the “Grand Central Station of the West” by some, is because of all the natural light that streams into it through the top of it. 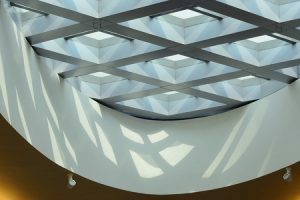 The transit center boasts a walkable skylight as well as a bunch of light columns that let natural light in from all different angles. Amazingly, the intricately designed skylight and columns were nearly scratched from the design at one point. But after taking one look at what they add to the building, it’s hard to imagine it being as beautiful as it is without them. The largest light column in the Salesforce Transit Center runs right down the center of the biggest public space in the building in an area called the Grand Hall. It lets natural light pass from the park that sits on top of the transit center all the way down to the area where the train platforms are located, about two stories down. The column is so big and lets so much light in that it provides light to just about every single part of the 1.2 million square foot transit center at once. To create the column, a special fire-rated glass floor and skylight system called Contraflam Liteflam XT 120 had to be created specifically for the Salesforce Transit Center. It allows people to walk around on top of it safely while also letting light pass through it and down into the transit center. It’s one of the many things that has set the Salesforce Transit Center apart and turned it into a crowned jewel in San Francisco, a city that has more than its fair share of architectural wonders. It’s incredible to see glass being used in ways it’s never been used before. Bent Glass, Inc. loves to see the way the Salesforce Transit Center is changing the way people perceive glass and what it can do. We can provide our customers with glass for any number of projects. Call us at 215-441-9101 today to hear about our capabilities.